I was quite amazed during a recent sojourn to our new property site on the mango island province of Guimaras. 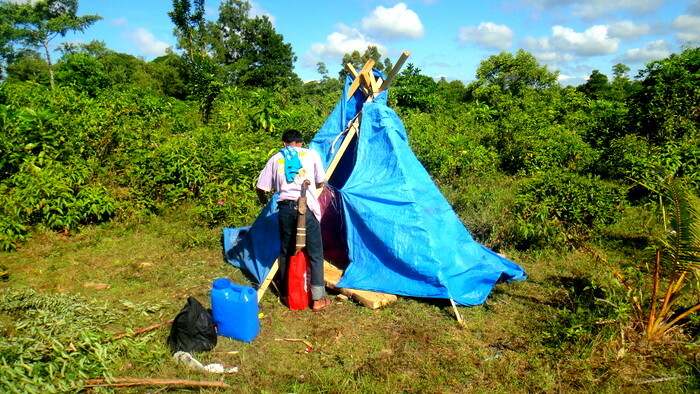 My brother-in-law Joery, chief foreman for our new home construction, had built a Native American tipi in the Philippines. If Joery ever pisses off his asawa, Alida, something all of married men are prone to do occasionally, he now has some new digs he can hide out in. Actually our caretaker at “The Farm,” Gerry is in charge of security at the construction site and Joery built the Native American tipi for Gerry as a temporary shelter. 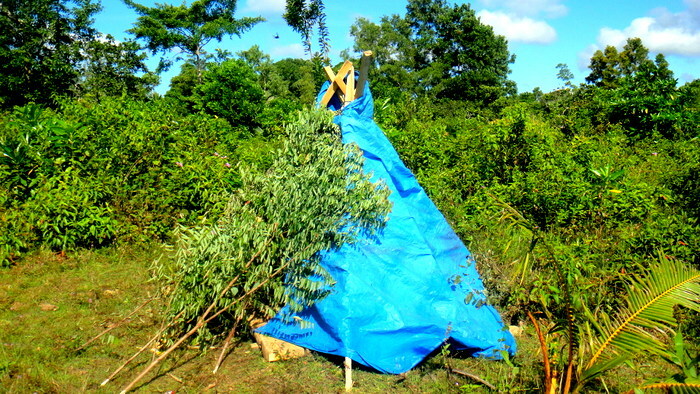 Several tree branches serve as the tipi cover where our caretaker sleeps at night, along with his oldest son. Cousin Emma’s Jade Market and Hollow Block Factory delivered 500 hollow blocks to be used in the building of Lolo’s nipa hut along with sand and ready mix concrete. Two cubic feet of sand costs P1,800, 40 US Dollars, as does two cubic feet of ready mix concrete. The 500 hollow blocks cost a total of P7,000, 14 pesos per block, a total of 155 US Dollars. The gravel, needed for mixing the concrete, will be dumped off tomorrow. Cousin Emma’s receipts are written on pieces of cardboard cut from a carton of Lucky Strike cigarettes. My wife’s cousin believes in recycling. 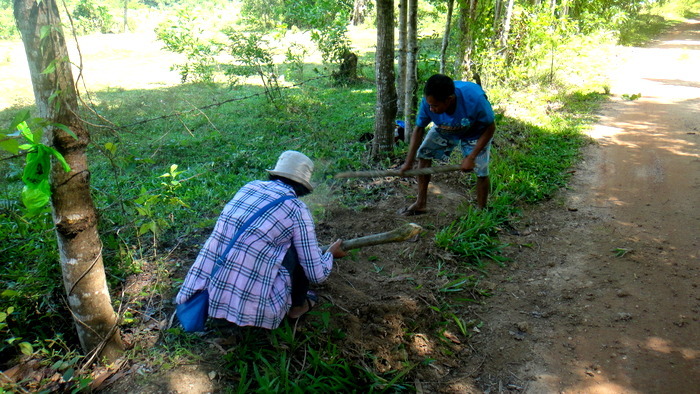 My asawa and Gerry are shown above clearing out a path for the delivery truck to pass. Yes, they’re using sticks instead of shovels. This photo was taken before the nipa hut crew arrived with more efficient digging tools. 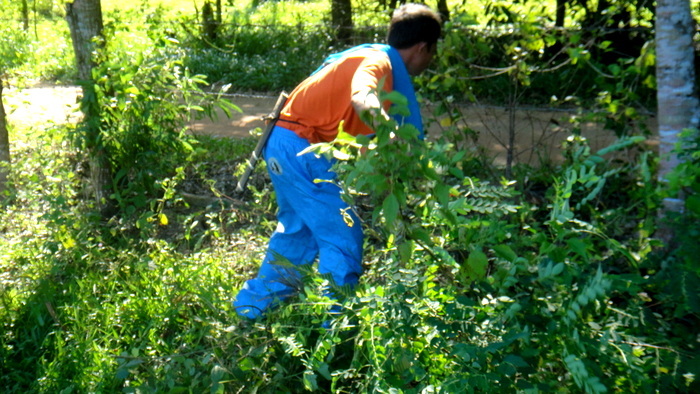 That’s our caretaker in the next picture shown clearing out some more brush during a visit to our new location a couple of days later. Gerry is a hard worker. He cares for two young sons by himself as his spouse died several years ago after succumbing to cancer. He doesn’t understand much of my English but he’s always dependable and quick to finish a task. 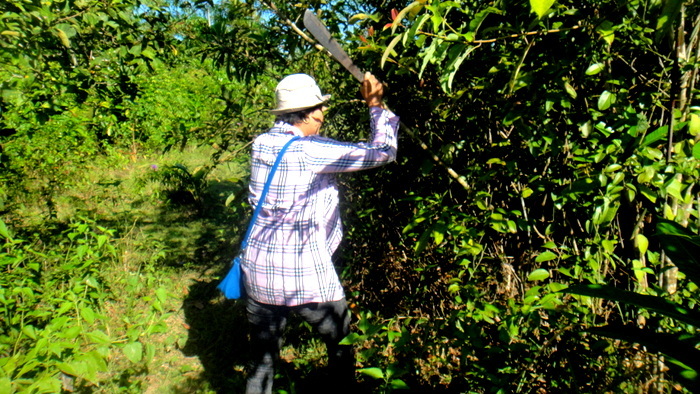 That’s my amazing asawa chopping away with her bolo. I can assure you that you never want to make her angry when she is swinging that thing! She might be 50 years old now but she hasn’t slowed down much in the almost 15 years we’ve been married. Though we have hired a crew to clear away brush on the the site where our new home in the Philippines will be built, she still insists on helping out. The smoke from turogturugon berries, according to my wife’s mother, a folk healer, can help a baby in the Philippines sleep at night. There are many of these bushes on our new property. Maybe I’ll have to try this natural remedy sometime when I have difficulty falling asleep. I tried eating a couple of these berries but they have no discernible taste and very little juice. 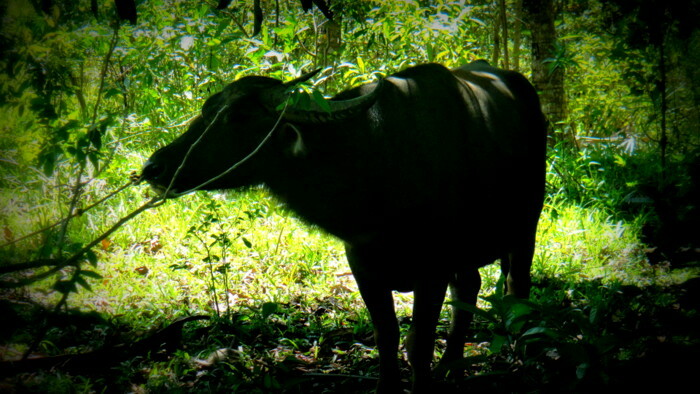 A neighbor’s carabao, the “John Deere” of the Philippines, was munching on some brush and grass nearby. 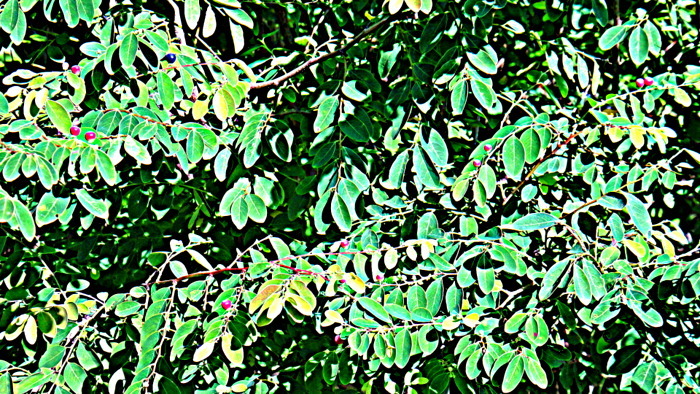 The animal was smart and was grazing in the shade as the temperatures approached 30 degrees Celsius. Rainy season seems to be over and we’ve had several dry, hot days strung together recently. The lack of rain will help our crew in the construction of the nipa hut but I doubt that the new Native American tipi will be able to keep anyone inside dry if it does rain again. Once the nipa hut is built, Joery’s crew will begin working on digging the foundation for our new house. As time goes by I’ll be posting new stories and pictures showing the progress our workers are making. It’s not easy working in the hot sun but it doesn’t slow these guys down. They’re used to it and and make sure their arms, legs and heads are covered from the blistering heat. We have plenty of water on hand for them, along with pan de sal and coffee for merienda time, because breaks are absolutely necessary under these conditions. Your about to break ground, this is what I have been waiting for, not as much as you have been though I doubt. Do you have snakes there, Dave. I hate snakes and it sure looks like a great place for them to hide everywhere in a tropical forest like that. Just curious about the cubic ft. measure of the sand and cement, is it perhaps cubic yard or meter instead, as a cubic ft. would not be much volume, and that price would be even more than here if its in cubic ft.
Let us all know if those berries help you sleep, if they do I will be planting them by the acre I think, since I cant sleep more than 4-5 hours at night anymore. Will you be digging a well onsite, or is there already a source for good water for drinking and construction. Was wandering what equipment they use there for well digging, since I cant imagine a big well drilling rig there like they use here. Maybe your John Deer mower will serve a dual purpose of powering a auger for drilling a well. I will be waiting to see if once we get there, if my wife will also start carrying a bolo, she is more a city girl type though. I know I will carrying one at all times, just for snakes if nothing else. Yes, we do have snakes here, Bill S. At my wife’s birthplace she had to dodge pythons that hung from the trees in her backyard. To this day, she still hates snakes. Down at the local trike stand, one of the locals was holding up about a six ft snake about 8 inches in diameter. We were whizzing by in a trike so I didn’t stop to ask what kind of snake it was. Cubic ft. I checked with my asawa who ordered the stuff. Her only reply was “cubic ft.” Since the well pump is down today, she has other things on her mind so I didn’t press it. Check out this link that may give you an idea how much a cubic foot equals, perhaps 40 pounds? I, too, only sleep about 5 hours a night. I was tempted to buy some OTC sleep aids while I was in Vegas but decided against it. I don’t want to get dependent on them. I have, however, been napping after lunch. We will be digging a well on site once the rainy season is officially over. Our maid’s father, also on the construction crew, is a diviner and located the well on my wife’s property at “The Compound.” We have a well we can use next door. It belongs to the brother of the man who sold us our property and he has said we can use it whenever we like. The well will be dug by our laborers. I, of course, will have nothing to do with anything that resembles manual labor. As you can probably guess by now, I too am kinda ADHD and ADD plus who knows what else. I like that you post prices for so many things there, but I always still need to do dollar equivalency so I totally understand , the price, maybe after being there for awhile I can bypass that part and stick to just pesos only. In doing prices though and working with construction material prices here on a daily basis, I sometimes notice that measurements are not always done as they are here, sometimes even here architects put quantities in unusual measurements, so thats why I was asking about the cubic ft. measurement (12x12x12) which is not much volume , a standard wheel barrow can hold from 3 1/2 -5 cubic ft. at one time, depending on size of it. Here most all loose building material is sold by the cubic yard (36x36x36 or 27 cubic ft.) gravel and sand for instance. One yard on premixed concrete weighs 2 tons, and most premix trucks here can haul 8-9 yards at once, but I only ever saw premix trucks there on commercial construction sites, and it seems there everyone mixes there concrete by hand on the jobsite. One word of caution Dave, when mixing concrete, dont let them get away making a soupy or watery mix, most like to do that cause its easy to spread when loose, but it vastly compromises the strength of the concrete, and in a area like that you need a strong mix and lots of rebar to withstand earthquakes and such. Do a little research on slump-tests for concrete, and make a mold and make them use it on each batch you mix in the beginning, once a mix recipe has been established, then they can do accurate measurements of sand, stone,cement and water for each mix they make. Stiff is always better when mixing concrete (and other things,lol) but it does make pouring it and getting in into the forms a lot more work, but it will hold up far better an longer than a loose mix will. Bill S, the longer you are here, the more you will not be concerned about the dollar versus peso price. I think more in pesos every day. But I’ve been in the Philippines over five years now. I do try to list the US Dollar equivalency in most of my posts for the convenience of my readers. Thanks for the advice on the concrete mix. Our brother-in-law Joery is on sight and has built a lot of structures here. He was part of the crew that put up the walls of our CR that we had built when we first moved to the Philippines. Joery knows our standards and does quality work on every job he works on. We are going to use much more rebar than what my asawa saw being used during construction of new homes back at our former enclave in Iloilo, Savannah Subdivision. My brother-in-law and wife know FAR more about construction than I will ever know. I’m letting them take charge and I’m getting out of the way. Things will get done much faster that way. I will probably only visit the job site occasionally. My asawa will go there more often. We are fortunate to have a good crew and a good foreman who we both trust completely. Won’t be long before you start your house. It’s good the rainy season is done already so it won’t delay the construction. We still get a little rain, but we always have a cool breeze and we really don’t even use our fans much. Anne too is scared of snakes even if they are dead. When she was a child a snake fell on her head and it was promply killed by her father. So I don’t blame her. We haven’t seen rain in almost a week, Papa Duck. I still need the fan every night. We have had some pretty hot days recently. Melinda says she thinks summer is starting early. Last November and December we enjoyed some very mild weather with temps even dipping to a low of 66. Well, if a snake fell on my head, I wouldn’t much care for them either. El Nino is gearing up. Less rain hotter days. On another note I have sent 2 emails to your philippinesplus@gmail.com account. No response. Is that a good address? We are leaving today for a nice 4 days mini vacation in Iloilo. Please help a man that has not had a cheeseburger or steak in 2 years. Where can I find the best non imitation cheeseburger and steak in Iloilo. Yeah, I thought I had heard earlier in the year that El Nino was going to hit, Roxas Ron, thanks. Had a little shower today but that’s been it for about a week. Sorry about the no response. Best way to reach me ASAP is through this comment section. I’ll have to revise the email for my contact page. Best burger in Iloilo? Well, I have gotten bad reports about Crave Burger in the Smallville complex recently. I used to recommend them. You might try the Mesquite Grill in Smallville. I was there a couple of years ago and they had great burgers. I believe the American Legacy Restaurant across from SM Delgado in the downtown area has some good burgers. If memory serves me correct, one of my American friends in Iloilo gave me the 411 on them. Don’t bother with Perry Todd’s so called “All American Burger.” Their burgers are big but are mostly all bun and I think they use a meat filler. Best steak? Hmmm. I have heard that the Rio Hotel has some good steaks but the expat that told me that died a couple of years ago. Or you might try the Mesquite Grill. Dave, you can give my contact info to RoxasRon if you have his private e-mail. Don’t have his private email, Rease. Only the email that is shown on his comment, sorry.